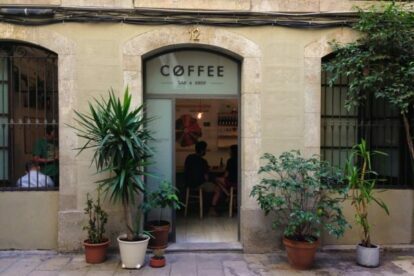 I discovered this little coffee corner whilst carrying out research for a Master project in Poblenou. As I was approaching the place, I could already sense the aroma of freshly brewed coffee. After observing it for a while and enjoying the coffee smell, I started chatting with the guy behind the counter who turned out to be the owner of the place. He told me that the whole Nomad concept started out in London, where he used to sell coffee in a food market stall on weekends. The passion for coffee-making developed further until he learned how to toast coffee himself and finally created this small laboratory of coffee heaven. Apart from a good cup of coffee, it’s the whole culture behind it. You will only find seasonal coffee and fresh harvest. Therefore, every 3 or 4 months the varieties on the menu change a lot, depending on the time of year. Currently, Nomad has 3 spaces in the city: the Nomad Coffee Lab & Shop, the Nomad Roasters House and the most recent, Nomad Everyday. The first was the precursor, a beautiful and simple place where, apart from buying coffee, you can taste all the varieties of the season.